Canine Myofunctional Therapist, Mal Lynch, with her treasured best friend, Daisy, a rescue girl from the wonderful, Lort Smith Animal Hospital. Mal is a fully qualified and experienced canine masseuse, with her areas of expertise including pre and post-surgery; performance dog massage, and maintenance massage . Her own dog, Daisy, has been the recipient of many massages following her two knee replacements and major surgery to both hips. 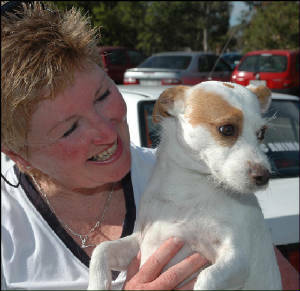 (Daisy is a rescue girl from Lort Smith Animal Hospital). Australian Bush Flower Essence training was undertaken in 2005 and 2006. Practitioner status is currently being applied for. Magnetic Therapy (such a powerful tool) is also used in her massage routine. Bowen Therapy for Small Animals is currently being studied with world-respected Elizabeth Mitchell. Continuing education in the field of animal massage is of great importance to Mal and she is expanding on her skills by further study of Animal Naturopathy / Homeopathy commencing 2006.